National Remote Sensing Centre (NRSC) is a premier organization in the field of Space Research. Located at Hyderabad, NRSC is functioning as a full-fledged center of Indian Space Research Organisation (ISRO). Prior to 2008, NRSC was functioning as a constituent unit of National Remote Sensing Agency (NRSA) under Department of Space (DOS), Government of India. NRSC is responsible for remote sensing satellite data acquisition and processing, data dissemination, aerial remote sensing and decision support for disaster management. It also sets up data reception stations for acquiring data from remote sensing satellites and engaging in collaboration projects with stakeholders from different sectors viz. education, weather, mining, transportation , disaster management, etc. NRSC planned to develop its Shadnagar Campus near Hyderabad by incorporating sustainable features and green building technologies. The project name was NRSC – IMGEOS and NDEM Facility; IMGEOS stand for Integrated Multi Mission Ground Segment for Earth Observation Satellites, while NDEM stands for National Database for Emergency Management (NDEM). The Master Plan divided the total area at NRSC Shadnagar into five zones to accommodate their new project’s requirements. A renowned R&D facility like NRSC with 24X7 operations has its own challenge in terms of uninterrupted operations. To design, build and operate a facility of such nature keeping in mind the performance and sustainability requirements is indeed a difficult obstacle to overcome. NRSC Team made it clear that they will not accept anything less than a Platinum Certification. This posed a creative challenge to all the project team members including CONSERVE, Architect (SSIDC) and all other stakeholders to dedicatedly pursue the goal with singled minded focus. Right from the design stage, all ideas, and strategies were developed around the goal of attaining Platinum Rating. The design of the building was developed keeping in mind that minimum heat ingress and maximum natural lighting without glare are ensured. Envelope material like aerocon blocks for walls, high reflective paint with under deck insulation in roof, high performance glazing, efficient lighting design, occupancy sensors and day lighting controls, variable air volume system, efficient water-cooled centrifugal chillers, secondary chilled water pumps with VFD, renewable energy through solar PV panels etc. are some of the key solutions provided towards achieving the sustainability objectives. After conducting numerous massing analysis, the building was designed in a circular manner to ensure minimum heat ingress. The window to wall ratio was designed by doing a space by space daylighting analysis for optimum day lighting. The provision of cavity wall with air gap on certain faces was done to minimize the heat load due to envelope. The natural day lighting requirement for project met the stringent LEED mandatory compliance that 75% of the area should be naturally day lit. To overcome dark pockets, effective skylights locations and light pipe technology were used to achieve this compliance requirement. Lighting sensors were positioned for automated lux control ensuring no human intervention. This along with high efficacy lighting fixtures lead to a savings of 64 % in lighting power consumption over the ASHRAE baseline. HVAC design incorporated all the latest high performance features like VAVs, VFDs, high COP chillers, redundancy through VRFs at critical locations, etc. leading to a savings of 34 % over the ASHRAE baseline. Renewable energy through solar powered panels (300 kWp) contributed to 18% of annual electricity consumption. Visual access to outdoors for 90% of all regularly occupied spaces was designed for a high productive and healthy work area. The project achieved an overall energy savings of 29 % over ASHRAE baseline leading to full 10 points on optimize energy performance credit. Overall in the energy module it achieved a rare feat of 16 points out of 17 Points. NRSC IMGEOS & NDEM Facility received LEED India PLATINUM Award from IGBC. A total of 59 points were awarded out of maximum 69 points. 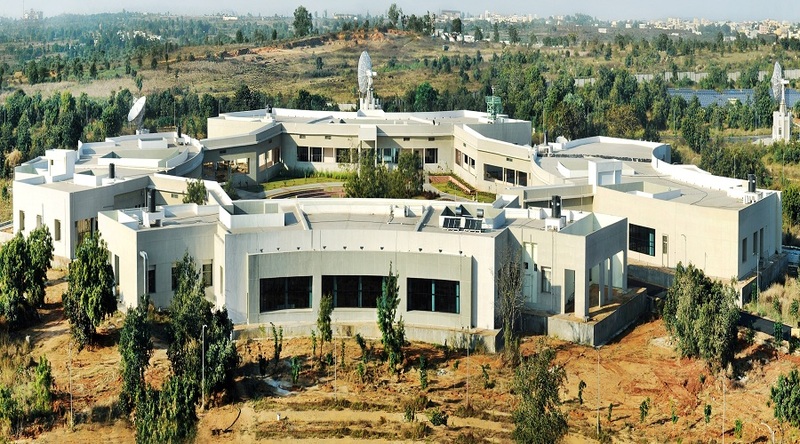 This is the first green building among all the ISRO Centers and a first-of-its-kind effort by NRSC.